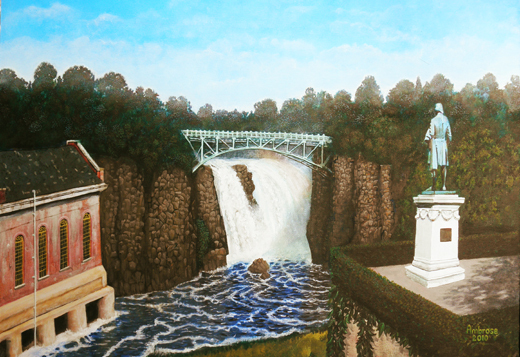 At long, long last, the painting that has sat neglected on my easel for perhaps a year, now completed this day. Prints may become available in the near future. Few events are as disappointing to a music-fan as a poor performance by a favorite band. 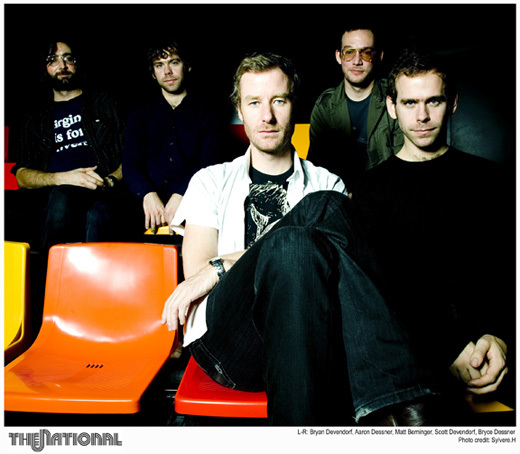 In the past few years, The National has been catapulting from Cincinnati obscurity to Brooklyn hipster notoriety to national (no pun intended) renown on a perfect mix of clever melodies, offbeat rhythms and poetic, self-effacing lyrics delivered by frontman Matt Berninger’s velvety, understated baritone. This night, besides Beringer, there were one or two alternating backup vocalists, a couple of keyboards, guitar, drums, bass and a brass duo with trumpet (or such) and trombone. They played favorites like Secret Meeting, off the album Alligator and Squalor Victoria off Boxer; plus plenty from their latest release, High Violet, such as Bloodbuzz Ohio, Anyone’s Ghost, Afraid of Anyone and Conversation 16. Their live performances, two of which I previously had the pleasure to attend, have provided joyous, transcendent moments of musical rapture. Why did this all fail to happen this night? Radio City’s performance by The National went wrong, very wrong in every particular. Something about this grand, imposing venue must have provoked an insanely inappropriate intent to overstatement and bombast, the last things one wanted to hear from The National. Instead of singing in his inimitable, warm style, Berninger screamed his words, discarding all the musicality of his lyrics. His soft baritone was transformed into harsh barking. The National usually employs touches of brass for neat, limited color accents to the songs, but here a trumpet and a trombone blasted prolonged, piercing cries over and in opposition to the melody. The bass drum and bass guitar were so disproportionately loud and thunderously deep that the audiences’ chest cavities shook, even way up in the second and third mezzanines. The people in front of me were holding their fingers in their ears to shield against the criminally painful highs with which the sound team assaulted us. The only song in their repertoire for which this kind of chaotic, noisy approach actually worked was the hard-rocking Abel, which we heard as we exited early from the show, disappointed at being unable to enjoy the performance but still convinced that The National is one of the best bands to come along in the new millennium. This is the third CD released by the frontman for Cemetery-and-Western band, Ninth House, and it is rich with both new material and mature, acoustic reinterpretations of older songs, often featuring brave and innovative instrumentation to accompany Mark’s bitter-sweet, chocolatey vocals. Some songs have appeared on Sinnis’s two prior solo albums and Ninth House recordings. Mark hasn’t dropped his unwavering focus on death and how awareness of it causes us to see life’s experiences in a certain light. The opening track, “The Night’s Last Tomorrow” epitomizes this concept, and reaches heights of languid sadness thanks to the moody lap-steel guitar of bluesman, Lenny Molotov. “15 Miles to Hell’s Gate” has a more frustrated, angry tone, whereas “Your Past May Come Back” is surprisingly upbeat and showcases Marks’s amazing, mellifluous vocals. The “western” in “Cemetery-and-Western” is evident in “Fallible Friend.” My own particular favorite, “Follow the Line” is a dark, Ninth House treatise about suicidal-drunkenness that is incredibly melodious, even in this relatively light, accordion-accompanied version. Other tracks include new originals as well as acoustic tributes to the Sisters of Mercy, stripped down versions of songs by Sinnis’s old band, The Apostates, pieces with names like “Skeletons” and “Scars,” plus a New Orleans-flavored Louie Armstrong cover and Billy Holiday’s “Gloomy Sunday.” The album ends appropriately with a country gospel death-march. 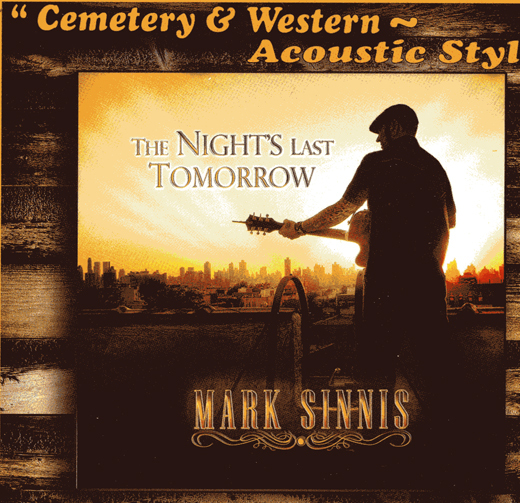 Sinnis’s style is a blending of folk-rock and traditional country, western, gospel and blues that is sure to please as well as fascinate music lovers of every stripe..